Promotional Ocean Gradient Navigator Sunglasses are a promo gift for all kinds of promotions such as expos, parties and especially outdoor events. These custom sunglasses are coming with UV400 lenses which provide 100% UVA and UVB protection. These ocean lenses are also presented with an imprint area of 1" W x ¼" H which make sure that everyone around will notice your brand logo imprinted on these Custom Navigator Sunglasses. Order now to grab our free custom design and free digital proofs facilities. 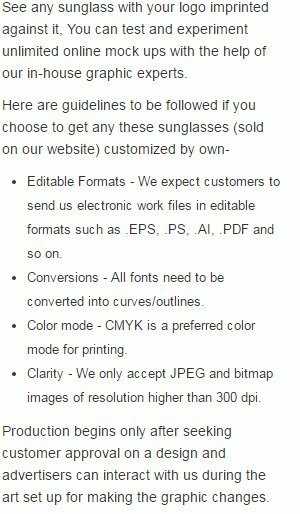 Request a quote to know price cuts that you can avail for wholesale Promotional Ocean Gradient Navigator Sunglasses. Available Colors: Silver Frame with Blue, Green, Orange, Purple, Red, Yellow Lenses.